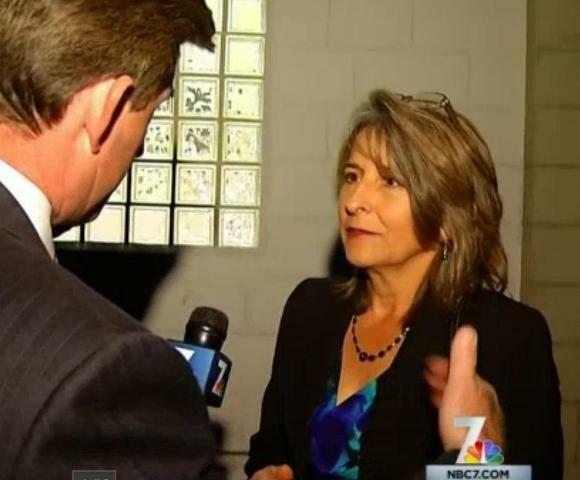 Lorie Zapf questioned by NBC7 reporter Dave Summers on the camera controversy. The packed Masonic Center became focused on the planned installation of the police surveillance cameras along OB’s waterfront. With standing-room only, Wednesday nights OB Town Council meeting became the center of the controversy over the 10-camera system, as Councilwoman Lorie Zapf (pronounced “Zaph”) was in attendance and forced to answer questions from the crowd and the media about them. Screen capture from NBC7 newsclip. It was the first opportunity for opponents of the cameras – and community members at large – to question and confront Zapf about the cameras, as she snubbed a December community forum on them and has refused to meet with or even talk to the organized group formed in opposition. During questioning by one reporter as to why she didn’t attend the forum, she said she didn’t recall the meeting. Always loving a good fight, conflict or whatever draws eyes, the local TV stations have capitalized on the OB camera controversy. And rightly so, as they are part of the media, they have cameras. Most of the television accounts of the cameras and Wednesday night’s meeting were ultimately sympathetic to proponents of the cameras but a couple were quite critical – and hammered away at Zapf. 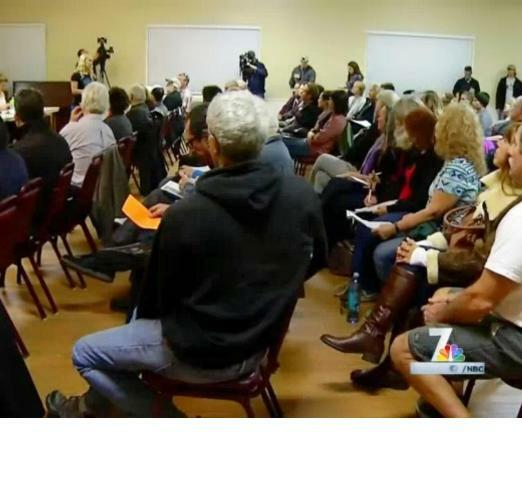 Ocean Beach residents met face-to-face Wednesday night with the councilwoman who is pushing for police cameras along Ocean Beach. Councilwoman Lorie Zapf has been met with resistance since she announced her 2016 legislative proposals, and on Wednesday night, the focus was on her push for surveillance cameras along the waterfront. During the meeting last night, Laurie Zapf was asked more than once if the police cameras in Mission Beach worked, since they had been vandalized. She was also asked if the cameras on top of the police shack in the Ocean Beach Pier parking lot worked. Neither she nor the police that were present at the meeting knee whether they worked or not. What an expensive boondoggle! It’s clear that the local media understand OB is divided on the cameras issue, just not the politicians and police. Looks like OB does not need camera but cops assigned to this area that are committed to protect and serve. Who is responsible for lack in police personnel and/or dispatchers? Falconer or the Ms. Police Chief or both? Whoever it is they are FAILING!